As the US economy rebounds and companies around the nation slowly expand their budgets, many design studios are looking for new clients so they can rebuild their businesses. But where are these clients and what kind of work are they looking for? Finding new business can be challenging for smaller studios lacking the proper resources, but this part of the job cannot be ignored. Many sources will list networking events, job boards, and online tools like LinkedIn for cultivating clients. But, as old-fashioned as they may seem, trade fairs are still viable sources of new leads. Trade fairs bring buyers, manufacturers, and distributors together to drive business. They are found in many cities throughout the world and can exist for any conceivable market in any conceivable sector. It is common to see a single event space host hundreds of trade fairs each year. Right now, the semiannual ‘NY NOW®’ trade fair (formerly known as the ‘New York International Gift Fair’ [NYIGF]) is on its second-to-last day at the Jacobs Javits Center in Manhattan. NY NOW® hosts over 2,800 exhibitors, supporting big and small businesses alike. 98% of the 35,000 attendees will place orders for products they see at this show. At the show, there are a lot of prototypes and market-ready work on display. There is also a good chance that designers engaged in packaging or branding will see their work in use. Even some designers themselves are becoming exhibitors, bringing their own creations to market. The volume of product may be troubling for sustainability-focused designers. The sheer quantity of items, how they are produced, who gets to use them, and their disposal are very important factors. (PE.01) So where does a designer start if they are looking to change this scenario? Attendees will certainly have varying answers to this question and many aren’t even interested in sustainability. However, this is often because of economic or aesthetic factors. NY NOW® encourages sustainable product development through their initiative: SustainAbility: design for a better world®. What started as an exhibit and educational series, has expanded to market and lifestyle industry criteria for new sustainable products. For graphic designers, the SustainAbility participant list can harbor a lot of potential clients. Some of these exhibitors have already carried their sustainability strategies over to graphic design, packaging, and promotion, but many are currently focused on product development and have many yet untapped opportunities. A company with a comprehensive sustainability strategy is PlanToys®, of Trang, Thailand. (EN.02) Regularly in attendance at NY NOW®, they were first present on the SustainAbility list in 2013. PlanToys® produces reclaimed rubber wood toys for the infant to kindergarten range, always striving to meet or exceed eco and health safety standards globally. But it goes farther. Using only formaldehyde-free glues and non-toxic/lead-free dyes, they also only use salvaged wood, rescued from the waste stream of the local rubber industry. Their latest product is PlanWood®, the byproduct of their own post-production reclamation system. The company is very socially active in Trang with locals employed in all facets of the company. PlanToys® also funds eco-education in numerous Trang schools and reforestation/coral reef protection efforts throughout Thailand. 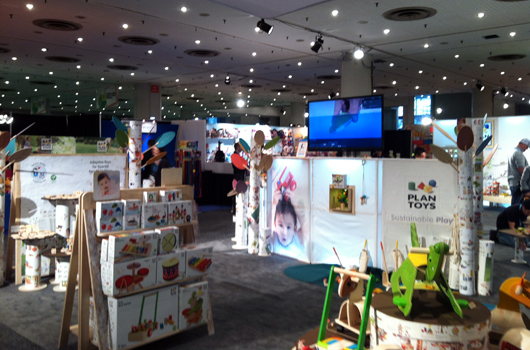 Jay Chanthalangsy, the Marketing Coordinator for PlanToys® in the US, says that its all integrated into their system. The system is so robust that the PlanToys® founder has no problem showing their latest work to their competitor.”(EC.04) Much of their sustainability strategy and LCA information is also found on their packaging and in their print/online literature, illustrated by their graphic design team. It can serve as a good example for companies new to sustainability to learn from. It can also give designers insight into the kind of storytelling that successful sustainability-focused brands require. On the other end of the spectrum is ENI Puzzles®. A NY NOW® attendee for the last 4 years, they have yet to be included on the SustainAbility participant list. Their lead product is Kim’s Column, a handheld puzzle, popular with museums and game stores across the US. While working on the latest edition of the puzzle, the company put significant energy into refining their entire production process. Everything from packaging to manufacturing facilities were evaluated (EN.02), which led to the drafting of a lifecycle analysis for Kim’s Column. ENI President and “Fearless Leader,” Thomas Sebazco, is a supporter of sustainable-focused design. He claims that the current economics of the puzzle tie him to a business-as-usual model. Still, that hasn’t stopped him from planning for the future. Tom knows that the sooner he embraces sustainable practices, the better his company’s chances of survival. (PE.05) Like a good businessman, he’s looking for the right opportunity. There are many possible clients like these at NY NOW®. Most haven’t begun thinking about sustainability, but are looking for a competitive edge in their market. (PE03) Trade fairs can give the sustainability-oriented designer the opportunity to offer many businesses this edge at the same time. (CU04) To be clear, NY NOW® gives the designer over 2,800 opportunities … in one building. In the age of email blasts and social-network driven marketing, trade fairs like NY NOW® provide the face-to-face interactions that ultimately get designers noticed. Will it get sustainability-oriented designers noticed? NY NOW® Website, 2014. Online. Information about NY NOW® for all prospective attendees, updated to reflect new features in the latest event, as well as statistics from the most recent show. NY NOW® SustainAbility Webpage, 2014. Online. Information about the sustainability efforts of NY NOW® since 2009. Includes past and present participant lists, as well as juried exhibitions and relevant seminars for show attendees. Overview of PLANToys®, their history, and their social initiatives. Website also covers the organization’s charitable giving. Interview with Jay Chanthalangsy, US Marketing Coordinator for PlanToys®, January 14, 2014. Unpublished. 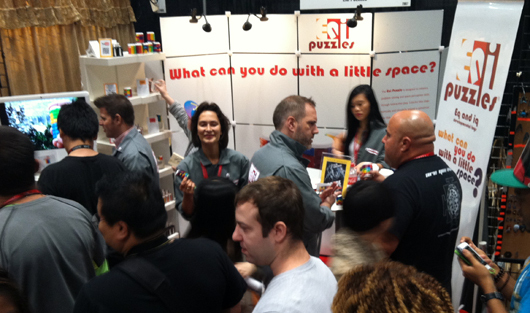 Interview with Thomas Sebazco, President and ‘Fearless Leader’ of ENI Puzzles®, January 14, 2014. Unpublished. It’s been one year since the formation of Times Three (we didn’t have our name yet). We really started working together long before then, coming together to tackle big jobs on an as needed basis. It was only after an amazing week at Tales of the Cocktail in New Orleans, creating a Pisco tasting room for the Peruvian Trade Commission, that we all looked at each other and pondered the benefits of working together permanently. Anyone who’s ever started their own business has a similar story. That moment when it seems like the best idea in the world to start a business. The challenge is understanding how running a business is different from working as a freelancer or managing a large-scale project. However, our design brains are up to the challenge. We look for innovative solutions to running Times Three while looking for innovative ways to meet our clients needs. So, what has one year brought us? A bigger role at Tales! For the Peruvian Trade Commission, we completed another tasting room plus private dinner and produced an accompanying cocktail book. We were also awarded a project from the Tales of the Cocktail staff, developing event decor for their Spirited Awards gala. Its funny how things circle back around that way. For now, we are happy to have our first year under our belt and we look forward to expanding our current relationships while we create new ones. Thanks to everybody who’s given us work or who’s taken the time to read this. Your support enables us to continue doing great things.